Career Dev Prompt #8: What does it really take? As a professional – you should have Career Goals. If you don’t want are you doing reading this blog? Today we are thinking long-term and this week’s prompt is aimed at helping you clarify these long-term goals and potential options for getting there. I am thinking DREAM GOAL, DREAM ROLE. TOP OF THE FOOD CHAIN aspirations. If you haven’t already got this in a prominent place – write it down. Now! Great. Now I want you to think about WHY you want to do this and what you current plan is for getting there. DO you have one? Have you though beyond your next paycheck, pay rise, promotion? Have you thought BIGGER? No? Well Let’s get started. Have a conversation and learn what it really takes to get your Dream Job. PROMPT: This week I want you to have a conversation (or coffee date) with someone you know that is currently doing the job or is on their way to doing the job. Even learn more about how your boss got where they are today. 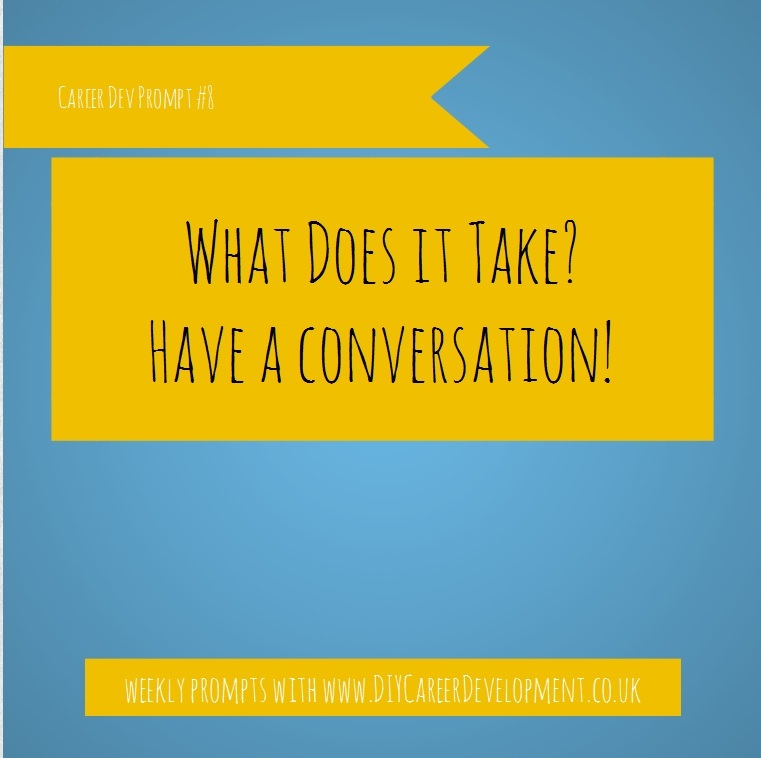 Subscribers of our Career Development Prompts Premium Plan (which is only £30 for a 2014 subscription) will be able to download our 8-page ‘have a conversation’ action plan and learn what to ask during the conversation to ensure you get the information you need. Here in the UK we have what are known as Disclosure and Barring Service (DBS) Checks (formerly known as CRB checks). An employer can require you to have a DBS for certain jobs such as working with children, working with animals, working in health care, working in financial services, accountants, lawyers, working for a governmental body or working in the police force. Some volunteer roles also require a DBS check. You can find out more information on the home office website. I work in a role requiring a DBS check. I am currently due for a renewed check. This requires a lot of detailed information – some of which I had kept from my last check (but needed updated) and others that I could not find a record for. To complete the DBS form you need to provide the details of your background and your previous addresses for the last five years. If you already keep a record of previous addresses – review and update yours today. For those of you who don’t write your list now. If you don’t own your own home and change rentals frequently this can be a challenge to remember so save yourself the time and keep a record in your career journal, your career development folder or even your household filofax. Subscribers of our Career Development Prompts Premium Plan will be able to download our DBS Information Insert/printable which is available in both a5 and personal size. Often the New Year brings with it thoughts of new starts, new challenges and new jobs. If you are looking for a new job (or simply want to see what is out there) why not sign up with your local or industry specific recruiters. Contrary to popular opinion – a Recruiter works for the employers (not the job seekers). They are looking for the right individual to fill a specific role. They are not there to find you a job (unfortunately). That’s right – you still have to do the hard work. It gets your C.V. in front of them. Ideally you should approach them with a role in mind, or at least give a clear indication of what you are looking for. If they have nothing currently on their books, they will have your C.V. on file for when an opportunity arises. You may get sent details of vacancies before they are officially advertised (or as soon as they are advertised). Particularly if your recruiter thinks you are a good match for the job. Your C.V. is on file so you can apply easily and quickly. A recruiter can advise on the job market and trends and give you an indication of when jobs will become available. Some recruiters offer C.V. advice and Interview preparation while others may help you with insider knowledge regarding format of interviews or contract and salary negotiation. Finally, where possible nab a face to face meeting with your recruiter. A face to face meeting provides more of an opportunity to get to know each other, learn more about how you can help each other and they are more likely to remember you when a job materialise. Weekly Prompt: Sign up with a Recruiter. Subscribers of our Career Development Prompts Premium Plan (which is only £30 for a 2014 subscription) will be able to download our Recruiter Info Pack which includes the Recruiter Sign Up Record (pdf), Recruiter Job Applications Tracker (pdf) and the Recruiter Evaluation Form (pdf). You will also have access to our bonus subscriber only article: “Why is it important to pick the right Recruiter (and things you will still need to do).” Access the Premium Content Now. So, What is an extra bonus project? Well, an Extra Bonus Project is one of those things you have always wanted to do for your career but haven’t – because you haven’t found the time or the opportunity. Stop waiting for the right time or to have time. There will never be enough time. As we frequently say here at Finding Time – it is all about making choices and prioritising your time. It may seem like you never have enough time for these extra bonus projects, but they are important to get done – Why? Because by actually doing your extra bonus projects (and getting the credit for them) is actually what makes you stand out from the crowd. PROMPT: Write your list of Extra Bonus Projects and break them down into ACTIONABLE GOALS. Think about the extra bonus projects you want to get done over the next year and write a list. Remember: Keep your list manageable – I suggest four items. · developing personal and professional skills. These could then be broken down into specific items/actions depending on HOW you want to do them. Subscribers of our Career Development Prompts Premium Plan (which is only £30 for a 2013/14 subscription) will be able to download our Extra Bonus Projects Action Plan. What is a Knowledge File? Well there are many types of knowledge files and a number of them will probably be mentioned at various times on the blog, but today I am talking about ‘on the job knowledge’ and things that you learn from research, industry news and more experienced members of staff. I have built up shelves of knowledge files which I have categorised based on the type of work I am doing (particularly if it is not something I do day to day and might need to refer back to in the future). So if this is a long term practice – what prompted this post? Last week I spent half an hour on the phone to HMRC being passed from department to department from helpline to helpline. I am not a tax expert or a tax advisor. I am not even great with numbers. However, understanding tax is ancillary yet important to my job and while most of it is standard I keep a file of handy information that I might need to refer to in the future, particularly if I might need to double check the wording or requirements of a particular tax relief for example. Last week I reorganised my tax file. The file provides easy reference when my boss or a client asks for more information and when I need to explore a tax point further in my day to day job. This file works for now, but I anticipate that I will need to expand so that I have different sections for different types of tax. So yes, this type of file is specific to my job and what I do – but it makes a great and more importantly unique resource which makes my job so much easier as I don’t waste time checking the same point – and my boss knows he can ask. Prompt: create knowledge files for your job. Hopefully the prompt and the above example will be enough to get you started but if you love the idea of doing this properly why no check out our Knowledge File Action Plan which is available as part of our premium plan. Career Dev Prompts: Let’s Get Started Already!! 1. I wanted to finalise the prompt collection for my upcoming book which includes career development and career journal prompts (which are not available on the blog). 2. It is always a hard to decision to decide where to start. The book guides you through the set-up of a Career Journal (or your career plan), but here on the blog we want to share things that you can do at any time and choose whether or not to follow the weekly prompt. AND if you want to go even further you can sign up for our premium content which will help you create an Action Plan (and includes printables and downloads).